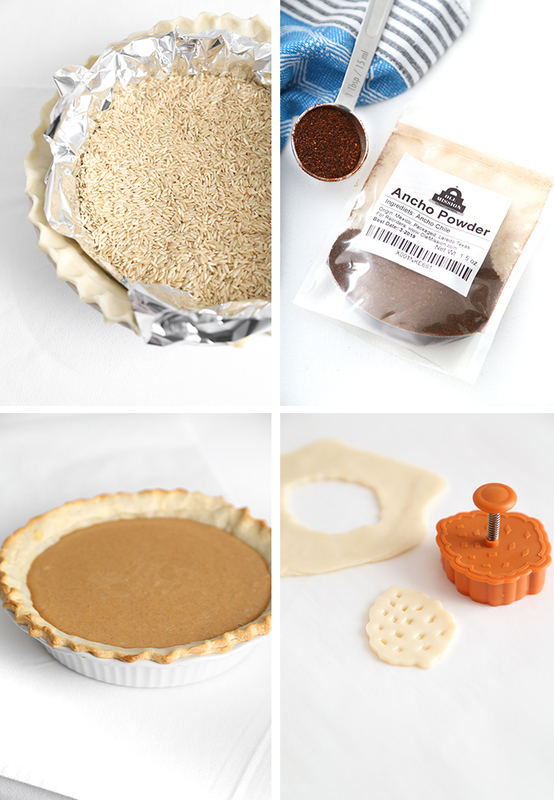 Ancho chile powder gives ordinary pumpkin pie spicy-sweet flavor with just a kiss of heat. 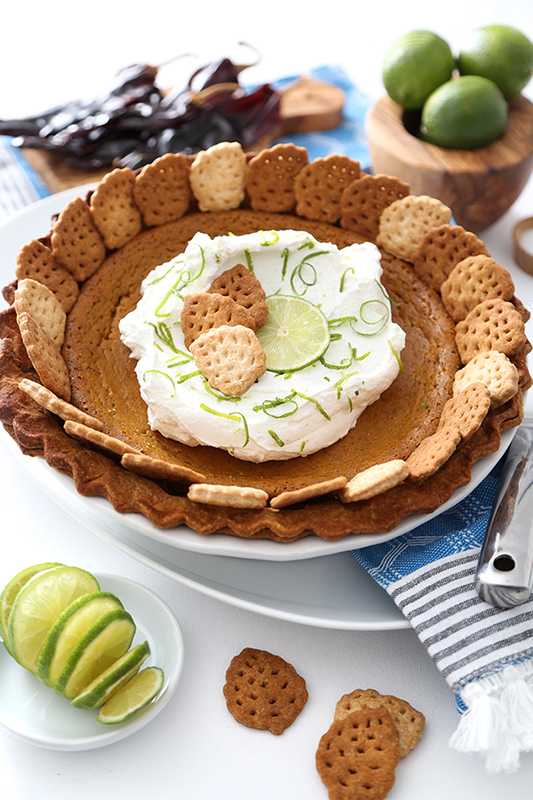 Zesty lime whipped cream is tart and cooling, and compliments the pie's peppery flavor. 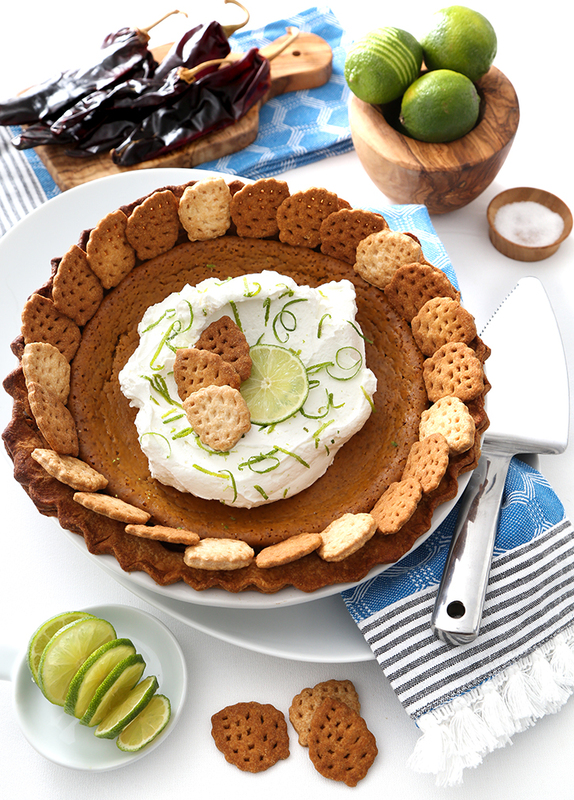 If you're looking for a new spin on pumpkin pie - and if you love Mexican cuisine - this pie is for you! For those unfamiliar, ancho chiles are poblano peppers (of chile rellano fame) that have been ripened and dried. Peppers that are allowed to ripen from green to deep red are sweeter, which gives them an affinity for all kinds of desserts. 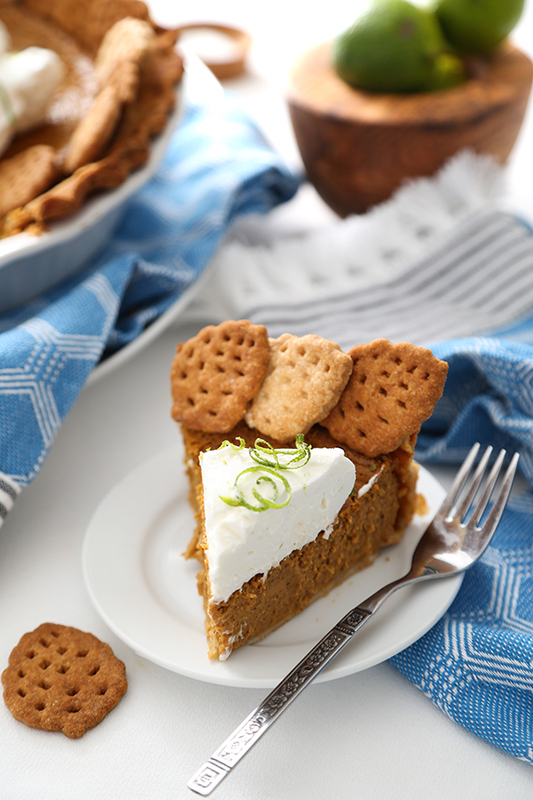 The use of ancho in this pie reveals earthiness without covering any of the pumpkin flavor. It's just different enough to surprise and delight your guests at the end of Thanksgiving dinner. The pie crust is blind baked, which means you'll need to fit the pie crust in the pie pan, top the crust with a sheet of aluminum foil, and then fill it 2/3 full with weights. For all of my baking gizmos and gadgets, I've never invested in any pie weights. Dry rice works just fine and I always have it on hand. The weights will help the pie crust hold its shape as it bakes. After a short time in the oven, the weights and foil are removed and in goes the pumpkin pie filling! Then the pie bakes until just jiggly (hehe). I made some pie crust cookies with a pine cone plunger cutter, but they remind me a little of agave plants with the leaves removed (is it just me?). The cutter is part of a set that I use regularly for pie-making, and you can find it for purchase here. The pie will bake for at least 45 minutes at 350F, but in my oven it took 1 hour. I recommend using a pie crust shield or strips of foil to cover the pie crust edges if your pie needs additional bake time. This will keep the crust from burning. This is a lovely departure from the usual pumpkin pie without breaking too much with tradition. There's no mistaking it for anything other than a rich, creamy pumpkin pie, with a little something-something extra-special. I hope you'll give it a try! Ancho powder is available at most grocery stores and online. Note: This pie requires a single pie crust. If you’d like to make the decorative cut-outs as I did, you’ll need two crusts. You can use two refrigerated pie crusts, or find my favorite butter pie crust at this link. 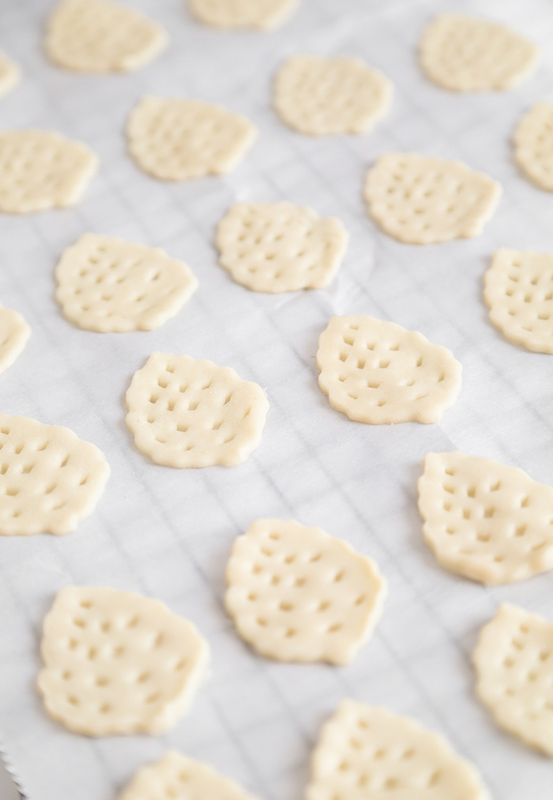 Bake the cut-outs on a parchment lined sheet at 350°F for 12-15 minutes. After they cool, use them to decorate the pie. Press the pie crust into a 9-inch pie pan so that it conforms to the shape of the pan. Flute the edges. Line the pastry with aluminum foil and fill 2/3 full with pie weights or dry rice. Bake the pie crust for 18 minutes, or until the edges are light golden. Remove the weights and foil. Reduce the oven temperature to 350°F. In the bowl of an electric mixer fitted with the whisk attachment, combine the pumpkin, cream, eggs, brown sugar, granulated sugar, ground ancho, cinnamon, nutmeg, and salt. Beat on medium-low until smooth. Pour the pumpkin filing into the pie crust and bake for 45 minutes, or until the center barely jiggles when shaken (my pie baked for 1 hour total). Allow the pie to cool to room temperature or refrigerate to set. For the whipped cream, place the chilled heavy cream in the bowl of an electric mixer fitted with the whip attachment. Beat until the cream slightly thickens, and then gradually add in the sugar. When the cream is thick and fluffy, gradually add the lime juice and lime zest. Beat well to combine. Refrigerate until ready to serve. When pie filling is firm, cut into pieces and serve slices with lime whipped cream. Pie filling recipe adapted from Sunset Magazine, circa 2004.